Extinct and living penguin comparison. 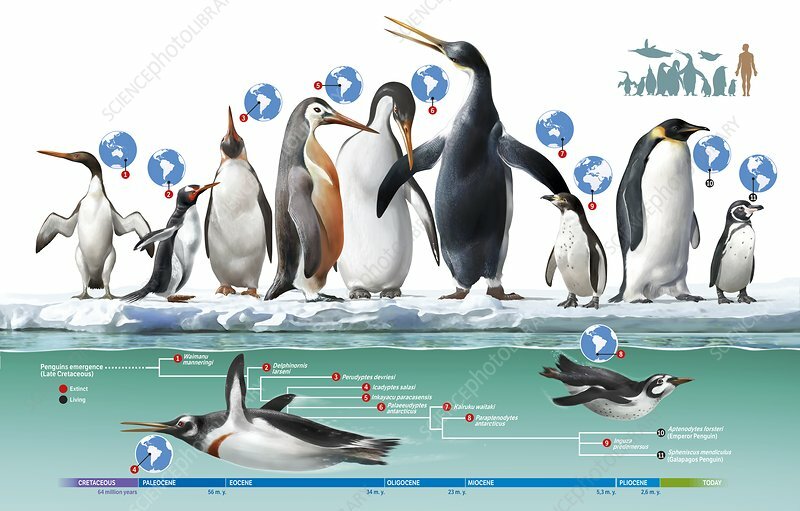 Illustration showing relative sizes, distribution, phylogenetic relationships and timeline of extinct and modern penguin species. From left to right: extinct species: Waimanu manneringi, Delphinornis larseni, Perudyptes devriesi, Icadyptes salasi (swimming, left), Inkayacu paracasensis, Palaeeudyptes antarcticus, Kairuku waitaki, Paraptenodytes antarcticus (swimming, right), Inguza predemersus; and living species: the emperor penguin (Aptenodytes forsteri), and Galapagos penguin (Spheniscus mendiculus). The Emperor penguin is the largest of all living penguin species, at around 1.2 metres. However, some extinct species, such as Kairuku waitaki, grew to 1.5 metres, and certain species were even larger than this.